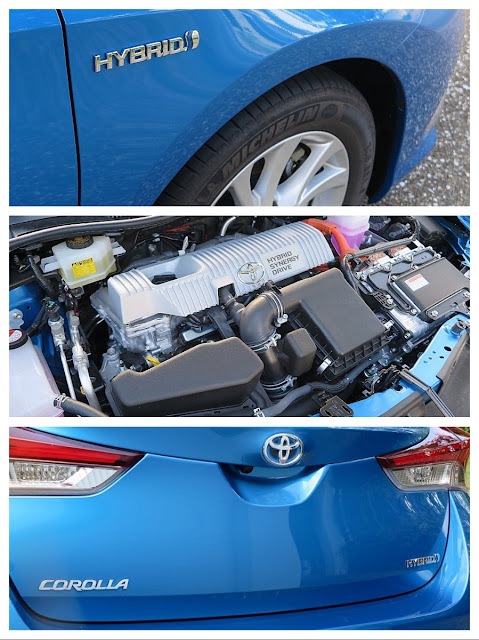 drivingandlife: COROLLA GOES HYBRID - HUH? 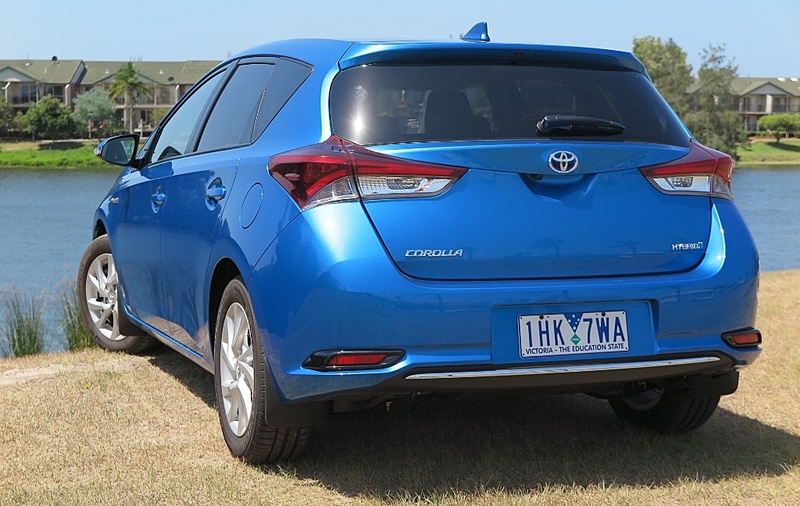 The world’s most successful car, Corolla, has sold more than 44 million cars globally, and in excess of 1.35 million in Australia, since it launched in 1966. The formula has been a worldwide hit, a flexible hatchback sedan, with room for five (at a pinch); modest, but economical performance, and longevity some brands could only dream of. Powered by one of Toyota’s oldest and most reliable petrol engines, you may wonder why in heaven’s name the company has launched a Hybrid version. 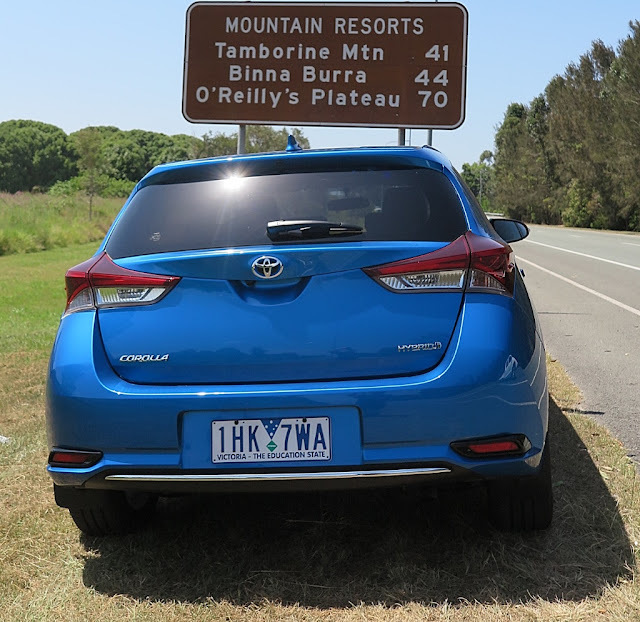 I’m certainly wondering the same thing; with Hybrid sales in Australia down 10% so far this year (YTD October), and a tiny total of just over 2,500 hybrids sold so far in Australia in 2016, do Australians need this car? 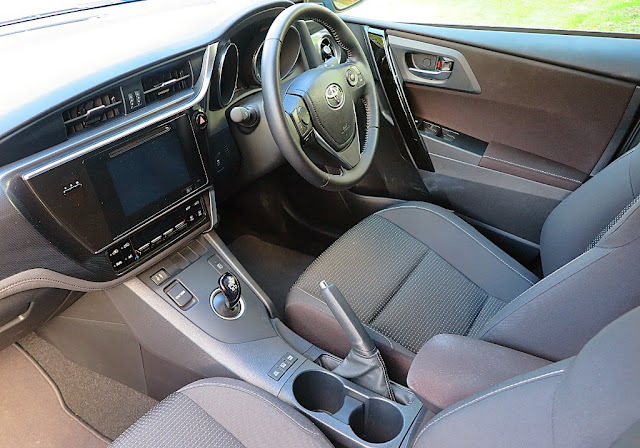 Search me, but here it is, at an almost $8,000 premium over the basic petrol-engined Corolla. I can say one thing for certain – it’s economical. However, just based on fuel savings, the $8K price difference would take 20 years for a payback! Watching the power-generation graphics on the dash becomes quite addictive, as you actively try to generate as much power as possible into the battery pack. Mind you, that activity then leads to other road users giving you the horn so you’ll speed up with the traffic flow. Hybrid power brings one real benefit to the Corolla, and that is a pretty nifty independent rear suspension, using double wishbones. That’s so the battery pack can fit under the rear seat, rather than intrude on the trunk space. This design change imparts better handling, but I suspect the car I drove retained the Japanese damper settings, because on anything other than ribbon smooth freeway, the ride was very lumpy. The Corolla package is indeed exemplary. I doubt anyone could truly want for a more practical city car. Quite frankly, that’s its forte. My advice is, don’t head for the mountains. All that impressive fuel economy goes out the window the minute you keep your foot flat to the floor. Driving through the ‘burbs, on the straight and level, the Corolla Hybrid is fine. Advertised combined economy is 4.4L/100km. Speed up to keep pace with the traffic at freeway speeds and the economy takes a dive; and as for attacking the local mountain range with verve – you won’t see the southern side of 10L/100km. As I found in the UK a couple of years ago, when I drove at the Motorway speed limit of 70mph between Heathrow and my digs in Cornwall. The fuel economy was awful, thanks to the Lexus CT220H having the drag co-efficient of a house brick, plus my exuberant driving. For the week, it returned 12.5L/100km! At least the Corolla Hybrid doesn’t pretend to be the totally ‘green’ answer to the whole issue of environmentally-friendly personal transport. It’s just one of the options for using less petrol. The Corolla Hybrid is well-built (in the usual Toyota manner); it’s comfortable and in this guise it’s well-equipped. 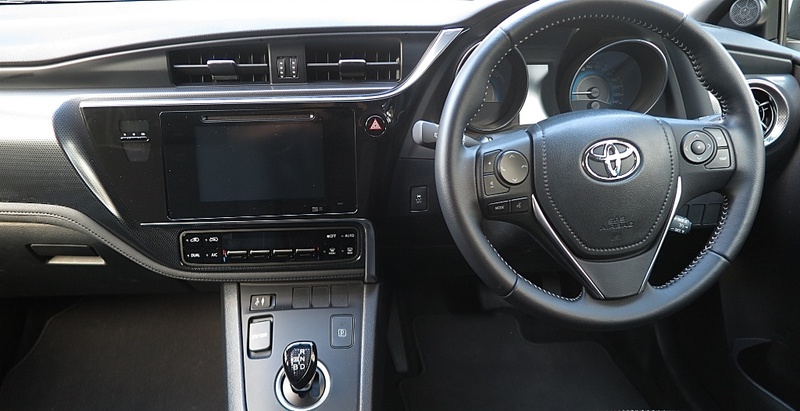 Excellent touch screen control system for everything apart from aircon; attractive piano black finish in parts of the cabin and a great sound system, courtesy of Toyota’s main supplier Fujitsi Ten. If choosing this car, at an $8K cost premium, imbues you with warm and fuzzy feelings toward the environment, well, you go for it. I’m afraid I’m back where I started. 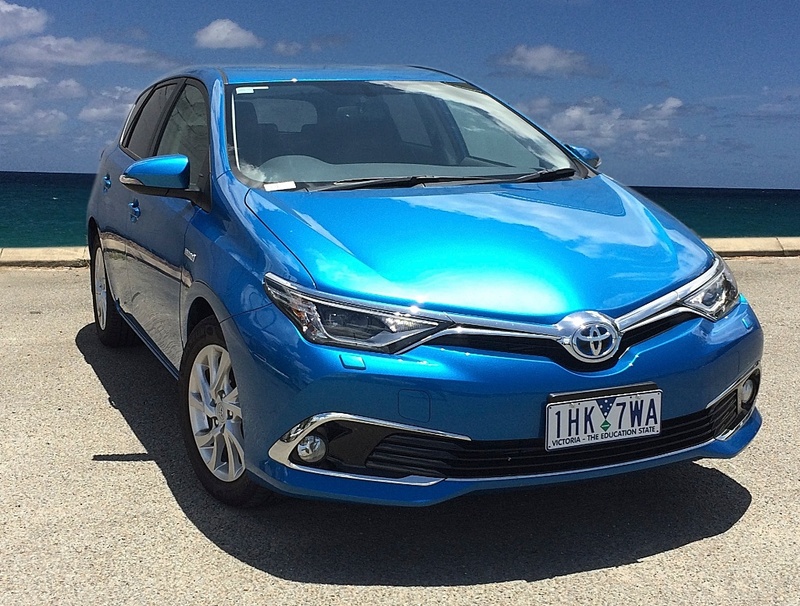 For me the Corolla Hybrid is an answer to a question nobody asked. Nice car, does everything well, but why?